By the time the gas you fill your car with hits the engine, it’s been through quite a journey. Even apart from its transformation from organic matter into fossil fuel over millions of years, the process of bringing petroleum to Earth’s surface, where it can be processed and distributed, is no easy task. Many of the world’s oil reserves are buried not just deep beneath ground but also under an ocean. 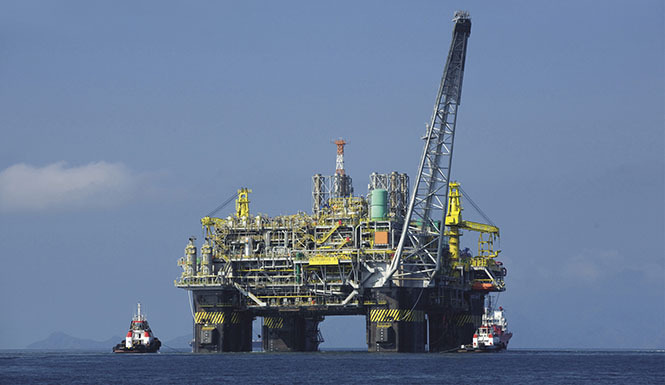 An oil platform in the Gulf of Mexico, for example, might need to be built over water with a depth of 10,000 feet. Extending from the platform, which floats on the sea, are specialized pipelines stretching nearly two miles to connect the operation to the sea bed. Then comes the drilling, which in some cases might need to go another 35,000 feet beneath the ocean floor before hitting its target. Long pipelines under high pressures face a multitude of dangers. Some are structural, such as natural vibrations generated by ocean currents and waves that bend the pipes back and forth—a phenomenon known as vortex-induced vibration, which Brower compares to the sway of a car antenna wire when driving on the highway. Other risks lie inside the pipe, where the right combination of pressure and temperature causes the hydrates in the oil to precipitate, forming a dirty, snowball-like mass that quickly grows. “That can build up to the point where the pipe is plugged and the oil flow stops, which is a nightmare to fix. You’re looking at a month of work and a cost of a hundred million dollars,” he says. 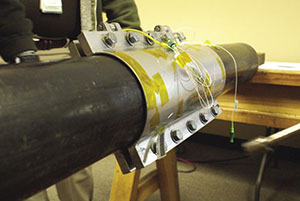 Partnering under a Space Act Agreement in 2010, ATI provided funding for NASA engineers to design and test new sensors and adhesion methods that would allow the company to equip pipelines and tension legs that hold the offshore platform upright for safety monitoring. Knowing how much stress the lines are experiencing is essential to safe operation, and when sensors gathering that data on tension legs fail, drilling operations must cease (“costing the company a million dollars a day,” says Brower). ATI has long provided fiber optic sensors for tension leg monitoring, but now Brower wanted to embed them in clamps that could be brought underwater and be easily installed by a diver or, in deep waters, a robot. That’s where NASA’s expertise and facilities proved helpful. They worked with ATI to select an adhesive that could bond underwater and provide a solid grip for the clamp’s sensors, and then they tested it in fresh- and salt-water environments. They also developed a method for embedding fiber optic cables in the polyurethane substrate used to create the clamps, providing them protection from the environment where they would operate. Once Brower felt confident that the design was effective, he took 16 of the clamps to oil platforms off the coast of West Africa, where an oil company had requested his help fitting older pipes and tension legs with new sensors. Divers first had to grind off years of contamination and marine growth from the pipes, but once a clean surface was established, installation took just 15 minutes. Brower says that the trial in West Africa showed that ATI’s new sensors are unlike any before them. While calibrating them, ATI was able to detect and precisely measure nearly everything happening on the platform, from tides, waves, and wind to the gentle pressure exerted by a boat docking. “We got it all and measured it very accurately. The operators on the platform were just dazzled; they were amazed that we were able to get that data,” he says. Pictured here are two tests of ATI’s clamps in a NASA lab at Johnson Space Center. On the left, a proprietary coating uses friction to keep the clamp in place. 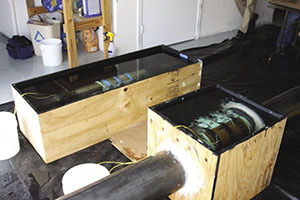 On the right, a special adhesive works even underwater to bind clamps to pipes. Now commercially available under the Trident Subsea Systems product line, ATI’s sensors are the first of their kind: hyper-sensitive safety monitors that can be retrofitted on older subsea pipelines. The clamps include models with and without adhesives—the non-adhesive clamps relying on a proprietary, rough industrial coating that digs into the pipe and uses friction to stay in place. For NASA’s part, the agency plans on using its experience designing these tools for future applications in space exploration. Seaman says that he and his colleagues have added these experiences to their “bag of tricks,” and that other centers have already been in contact with him to inquire about the applicability of this project to current NASA missions. NASA never stops obsessing over improving safety in its extreme environments, and that is a passion Brower understands well. “Even if you can prevent just one incident like BP had with the Deepwater Horizon spill—which has run up about an $80 billion price tag—the value in this technology is obvious,” says Brower.